Be the first to share your favorite memory, photo or story of Mossie . This memorial page is dedicated for family, friends and future generations to celebrate the life of their loved one. 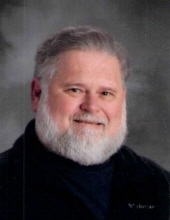 Mossie C. Eller (64), of Rogers died Friday, March 15, 2019 at Mercy Hospital. He was born January 9, 1955 in McAlester, OK to Carolyn Louise Silva and the late Charles Clifford Eller. Mossie worked many years as the school Maintenance Supervisor for St. Vincent de Paul Catholic Church. Known as “Mr. Mossie,” he loved interacting and mentoring the children. Many times he participated in school activities, including the talent show as Elvis. Mossie enjoyed football, hiking, camping, and movies. He was preceded in death by his father and all his grandparents. Mossie will be dearly missed by his mother Carolyn (Silva) Prescott of McAlester, OK; brother David (Donna) Prescott of Krebs, OK; sister Dian (Terry) Osburn of Norman, OK; Uncle Paul (Pam) Silva of McAlester, OK; niece, nephew, other relatives, and many friends, including special friends Vicky Kranski and her son Lawrence M. Benzmiller. A memorial mass will be held 8 am on Friday, March 29, 2019 at St. Vincent de Paul Church in Rogers. A graveside service will be on Sunday, March 31, 2019 at 2 pm at St. Vincent’s Cemetery in Rogers. In lieu of flowers, memorials may be made to St. Vincent de Paul School, 1315 W. Cypress St., Rogers, AR 72758. To send flowers or a remembrance gift to the family of Mossie C. Eller, please visit our Tribute Store. "Email Address" would like to share the life celebration of Mossie C. Eller. Click on the "link" to go to share a favorite memory or leave a condolence message for the family.